Hughton accepts LMA. Manager of the Year award praising support staff. | NUFC Blog. Another award for the Cockney Colossus. Newcastle United manager, Chris Hughton, accepted his award as the Championship’s ‘Manager of the Year’ in what has proved to be a year for the good guys in football, with the venerable Roy Hodgson claiming the biggest prize for Premiership Manager of the Year. “I am honoured to be recognised by the LMA and I accept the award on behalf of everyone at the football club,” he told nufc.co.uk, “But with this being a managerial prize I think special mention should go to the staff. “Colin Calderwood and Paul Barron have offered me tremendous support throughout the year. We are a managerial team and this award is for them as much as it is for me. “Coupled with that we have a terrific backroom team who also deserve special mention. “From the minute we came together as a group last summer, there has been a bond between everyone which has got us to where we are now. Chris, who won several ‘Manager of the Month’ awards throughout last season, has presided over what has been a record breaking season for the Magpies, albeit in a lower division. Under Chris’s management, the lads won the Football League Trophy with a total of 102 points, a club record points haul and the first time they have ever managed to make it into three figures. They also maintained an unbeaten home record at St James’s Park, playing to record Championship attendance figures. They finally secured the title after a 0-2 away victory over Plymouth Argyle at Plymouth’s Home Park stadium. Done a good job – next season if what I believe to be true with squad strengthening he will be sacked by xmas. I an glad to see that not only is CH getting the praise he deserves but is also giving out praise to those whose contribution is not so obvious.Though being the person he is i’m not surprised. 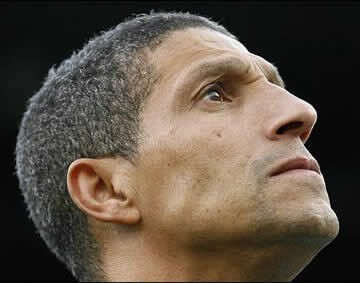 Hughton deserves a massive pat on the back for a job well done. I just hope he’s not hung out to dry this season. Cannot argue he’s done well. Well done, well deserved.